Discover the traditional side of Dubai and ascend the spectacular Burj Khalifa on an 8-hour sightseeing tour. With an informative guide, explore the old Al Bastakiya quarter and Dubai Museum, and ride an ‘abra’ boat cross Dubai Creek. 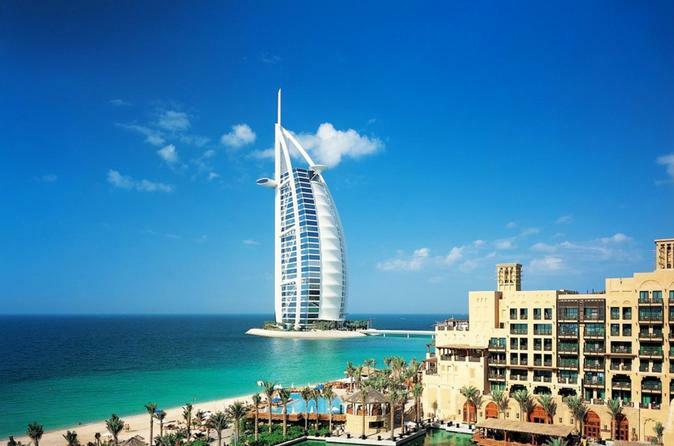 Visit Jumeirah Mosque, capture photos of the Burj Al Arab, and enjoy lunch near the Dubai Fountains. Finish at the ‘At the Top’ viewpoint on the 124th floor of the Burj Khalifa, marveling at the breathtaking views down over the city. Numbers are limited to 15 people for a small-group experience. Begin your 8-hour tour with a pickup from your Dubai hotel. Hop inside your air-conditioned minivan and set off to explore the city’s must-see landmarks. As you travel, hear from your guide how Dubai began life as a humble fishing village before a 20th-century oil boom saw it grow into one of the world’s most dynamic cities. Explore its roots with a visit to Al Bastakiya, the city’s oldest quarter. See the mud-built wind towers along the narrow lanes, and then chart more of Dubai’s history at the Dubai Museum, housed inside the 18th-century Al Fahidi fort. Stroll around the historical artifacts and trace the city’s lightning-speed development through the interesting scale models, photos and multimedia displays. Having explored here, take a scenic abra ride across Dubai Creek to Deira’s souks. Absorb the exotic aromas and colors of the Spice Souk and then dive into the Gold Souk, a maze of glittering gold, silver and jewelry outlets. If you wish, buy a souvenir from the souk (own expense), and then continue to Jumeirah Mosque, one of Dubai’s must-sees. Admire the gleaming domes and minarets of this magnificent modern mosque, and learn how its design echoes the medieval Fatimid style. Stop for photos of the sail-shaped Burj Al-Arab hotel, and after a tasty lunch near the Dubai Fountains, make your way into Dubai Mall to head up the Burj Khalifa, the world’s highest tower. Ride a high-speed elevator to the ‘At the Top’ observatory on the 124th floor, and marvel at the incredible, bird’s-eye views. Walk around the full-height glass walls to fully appreciate the panoramas before descending back to ground level. Your tour then concludes with a hotel drop-off.